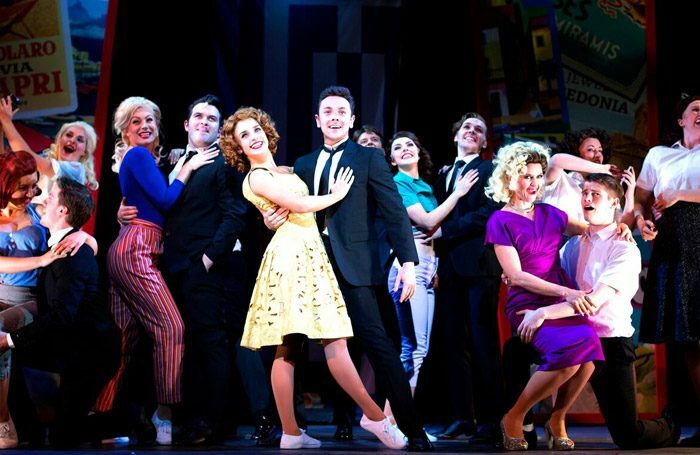 Based on the 1963 film – with some added Cliff Richard hits thrown in – Summer Holiday is an amiable if unmemorable musical, buoyed by the charisma of its lead. Former X Factor star Ray Quinn plays Don, a London Transport worker who embarks on a road trip with his friends (Billy Roberts, Rory Maguire and Joe Goldie, making the most of broadly sketched roles). Their unlikely adventures start when they meet a girl group with car trouble (Gabby Antrobus, Alice Baker and Laura Marie Benson), becoming further complicated when a singer (Sophie Matthew) stows away to escape her domineering mother (a hiss-worthy Taryn Sudding who, along with Wayne Smith’s hapless agent, gets many of the best laughs). Racky Plews’ production makes good use of Quinn’s boyish charm and athleticism. Don’s romance with Barbara is devoid of chemistry (though Matthew handles the comedy well), but the story is so slight it barely matters. A likeable cast negotiates the paper-thin plot and occasionally creaky jokes with energy, and although no one other than Quinn is vocally outstanding, the musical numbers are well choreographed and performed with verve. Not everything works. It’s 2018 – there’s no excuse for a major touring production to have an all-white cast or feature a gay panic joke, however fleeting. But it’s a show that knows its own strengths. It makes much of Steve Howell’s design – the iconic red bus gets a cheer on its first appearance – its leading man’s charm and a handful of much-loved hits.